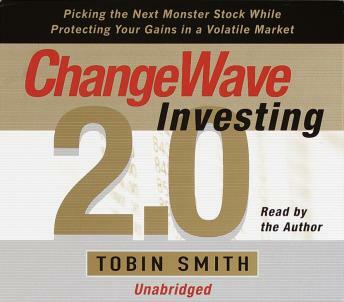 In his groundbreaking first book, Changewave Investing, investment guru Tobin Smith revealed his secrets for scoring triple-digit returns in the stock market by focusing on the emerging sectors that had the best potential for explosive growth, what Smith referred to as change waves. Now, in an all new audiobook that extends the ChangeWave philosophy to grapple with the vagaries of today's turbulent market, he shows investors how to achieve outsized returns even as the country downshifts from the irrational exuberance of the "bubble" economy to an economy based on real companies and real profits. profits. Creating the highly successful ChangeWave Investment Alliance based on the popular "open source" model of Linux and other innovative technologies, Tobin Smith taught listeners how to profit from the hottest market in history by drawing on the highest quality investment intelligence available-150,000 subscribers and their specialized knowledge of their individual professions. Using the ChangeWave principle he developed, the audiobook explains how to identify the stocks with the fastest growth potential before Wall Street does, how to screen out the pretenders, how to balance a portfolio between aggressive growth stocks and stocks with lower volatility, and how to invest limited resources for maximum returns. Specific guidelines for buying and selling during a volatile market provide savvy advice on embracing and benefiting from market meltdowns. From the ascent of his first book to the top to business bestseller lists, to his role as contributing editor to Fox's Bull and Bears, to the rapid growth of his electronic network, Tobin Smith's impact on the investment community has had the momentum of a tsunami. With Changewave Investing 2.0, listeners can learn the strategies and techniques that will allow them to profit from the transformational change our economy is only beginning to experience.